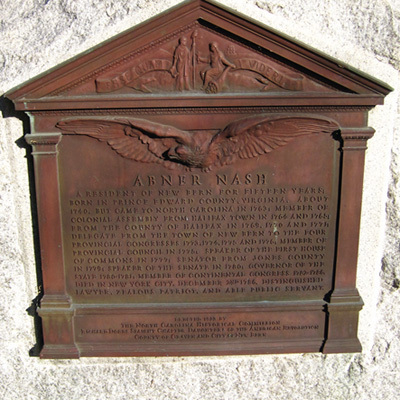 A bronze plaque commemorating Abner Nash is attached to a large boulder. The plaque was cast as the front elevation of a Greek revival architectural style building. In relief on the building’s pediment are several components from the Great Seal of the State of North Carolina, to include the state motto” Esse quam videri” meaning "To be, rather than to seem". Also prominent are the figures Liberty and Plenty facing towards each other. A bas-relief eagle in flight is directly below the pediment with the inscriptions appearing below the eagle’s spread wings. 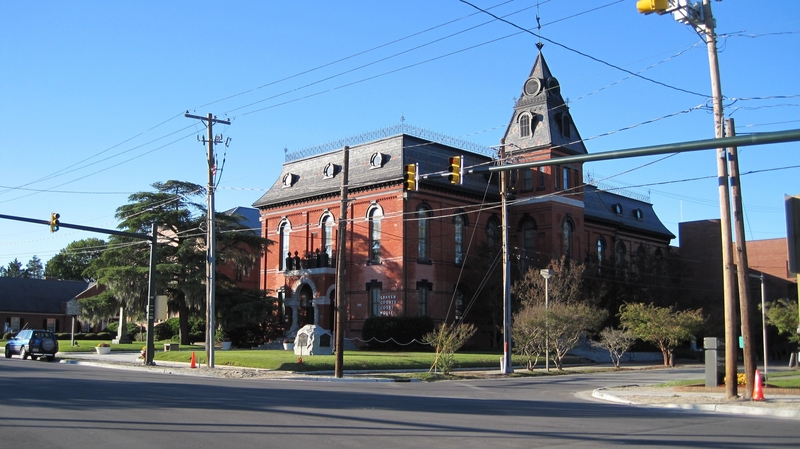 This marker was one of three dedicated on the same day and attached to the same boulder, the "Governors Boulder," at the Craven County Courthouse. They honor three men who held that position in North Carolina: Richard Dobbs Spaight (Sr.), Richard Dobbs Spaight (Jr.) and Abner Nash. 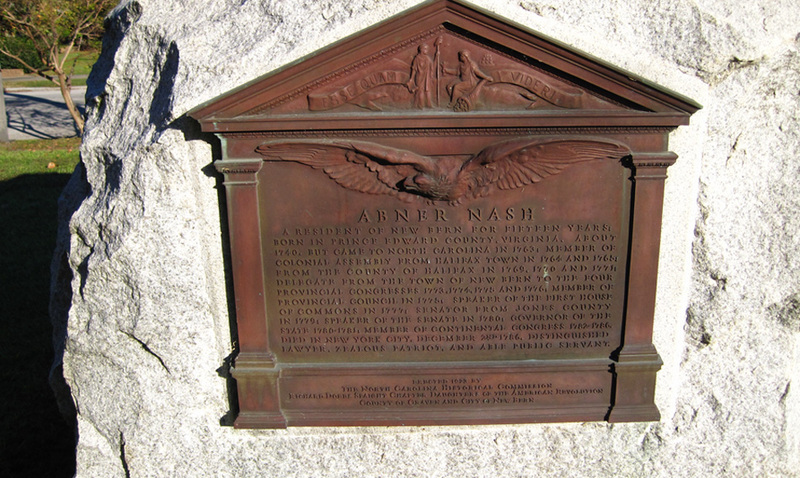 ABNER NASH / A RESIDENT OF NEW BERN FOR FIFTEEN YEARS; / BORN IN PRINCE EDWARD COUNTY, VIRGINIA, ABOUT / 1740, BUT CAME TO NORTH CAROLINA IN 1763; MEMBER OF / COLONIAL ASSEMBLY FROM HALIFAX TOWN IN 1764 AND 1765; / FROM THE COUNTY OF HALIFAX IN 1769, 1770 AND 1771; / DELEGATE FROM THE TOWN OF NEW BERN TO THE FOUR / PROVINCIAL CONGRESSES 1773, 1774, 1775 AND 1776; MEMBER OF / PROVINCIAL COUNCIL IN 1775; SPEAKER OF THE FIRST HOUSE / OF COMMONS IN 1777; SENATOR FROM JONES COUNTY / IN 1779; SPEAKER OF THE SENATE IN 1780; GOVERNOR OF THE / STATE 1780-1781; MEMBER OF CONTINENTAL CONGRESS 1782-1786. / DIED IN NEW YORK CITY, DECEMBER 2ND 1786. DISTINGUISHED / LAWYER, ZEALOUS PATRIOT, AND ABLE PUBLIC SERVANT. ERECTED 1923 BY / THE NORTH CAROLINA HISTORICAL COMMISSION / RICHARD DOBBS SPAIGHT CHAPTER DAUGHTERS OF THE AMERICAN REVOLUTION / COUNTY OF CRAVEN AND CITY OF NEW BERN.